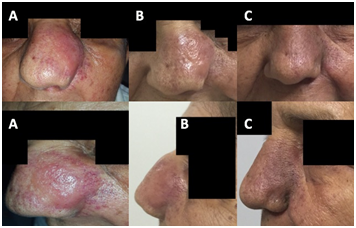 A 74-year-old female patient was referred to CDD Radiotherapy-Abreu Clinic, with a history of nasal obstruction, pain and epistaxis. The patient underwent subtotal endonasal resection 10 days earlier. A physical exam reported a Karnofsky (KF) score of 90%, ECOG (Easter Cooperative Oncology Group) I, a bulking left nostril, erythematous, warm and tender to palpation on the disease site, and no cervical lymphadenopathy. The cancer was classified as stage II. The first pathologic results were esthesioneuroblastoma. In light of the diagnosis, we suggested additional surgery and immune histo chemical (IHC) evaluation. The second surgery failed to obtain better results, but the pathologic diagnosis was now nasal lymphoma. IHC concluded diffuse large B-cell lymphoma (DLBCL) with an activated B-cell phenotype. Among postoperative changes, contrasted MRI of the head and neck reported residual vs. tumor recurrence. The patient and family refused chemotherapy; and due to the aggressiveness of the tumor, radiation treatment was initiated. Laboratory results were as follows: Hb 10.6 g/dl; Hcto 32.6%; negative serology for hepatitis, LDH 307.5 UDS/L and Epstein Barr Virus (VCA) IgG 305.0 U / mL, which is the only result outside of normal values, as the patient did not allow invasive studies such as bone marrow aspiration. We performed a contrast head-and-neck MRI and computed tomography (CT) exam without contrast, with subsequent image fusion. We used the Eclipse system (Varian Medical Systems, Palo Alto, California) for treatment planning, and performed the treatment using Varian’s Clinac 21iX linear accelerator, conforming the targets in 2 phases. The first phase (Figure 1) included a nasal planning target volume (PTV) and nodal PTV, both to 1.1 Gy, twice a day with at least 6 hours of difference until 22 Gy. The second (Figure 2), Second Phase GTV plus Bolus) phase included 1 nasal PTV to 33.75 Gy at 2.25 Gy once day. A total of 55.75 Gy was administered in 35 sessions. 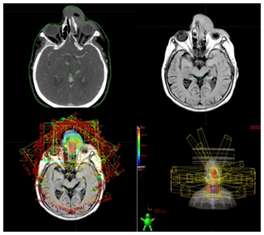 Figure 1: First Phase Treatment CT and MRI Planning. Figure 2: Second Phase Treatment with GTV plus Bolus. The average doses to the organs at risk (OARs) were: 28.81 Gy spinal canal; 34.7 Gy left optic nerve; right optic nerve 28.8 Gy; right eye 15 Gy; left eye 36.4 Gy; right parotid 12.4 Gy; left parotid 13.3 Gy; chiasm 17.3 Gy; thyroid 33.4 Gy; and brainstem 10.5 Gy. DLBCL with an activated B-cell phenotype. Differential diagnoses included: squamous cell carcinoma (SCC), extranodal NK/T-cell Lymphoma (ENKTL), esthesioneuroblastoma, and other types of lymphomas. Sinonasal malignancies are uncommon, with an annual incidence of 0.834 in 100,000 individuals in the United States, and a reported worldwide incidence of 1 in 100,000 [1,2]. These malignancies are more common in Asia and Latin America . After squamous cell carcinomas, non-Hodgkin lymphomas (NHL) are the second-most common primary neoplasms of the head and neck, with 2 principal subtypes: DLBCL and ENKTL . Nasal lymphomas are mainly of a natural killer (NK)/T-cell origin [4-6], and primary nasal DLBCL is extremely rare. DLBCL present most frequently in the paranasal sinuses. Patients with localized disease treated with locoregional therapy did not differ significantly from those treated with combination chemotherapy in IPI risk group allocation. It is important to note that treatment options for primary nasal lymphomas have been extrapolated from experience with lymph node DLBCL or nasal NK/T-cell lymphoma [7-9], and CHT is often the primary treatment for nasal DLBCL, followed by involved-field radiotherapy (IFRT) with doses ranging from 40-56 Gy . In a recent publication, the International Lymphoma Radiation Oncology Group, recommended doses from 30 Gy for consolidation after complete response to chemotherapy, and 40 Gy for residual or uncertain response [11,12]. In our case report, the IHC concluded: CD20, CD45, CD79A, MUM-1 positives and KI-67 >90% positives, with molecular studies positive for extra BCL-2 and CCND-1 signals. Due to the aggressiveness of the lesion and the refusal of patients and families to receive chemotherapy, we began hyper fractionated radiotherapy (HFRT) twice a day with a minimum interval of 6 hours. The initial target volume included the tumor and cervical lymphatic drainage (1.1 Gy/BID until 22 Gy) noting considerable reduction of the lesion in 12 sessions. We maintained the same scheme for 8 additional sessions, later changing to 1 session dailyto only the tumor (nasal GTV) (2.25 Gy until 33.75 Gy), administered 55.75 Gy in 35 sessions (Figure 3): Images pre-, intra- and post treatment). Because of the unusual location, tumor aggressiveness, and patient’s and family’s refusal to undergo complementary studies and chemotherapy, we delivered high doses of radiation. According to SEER (Surveillance, Epidemiology, and End Results Program) statistics from 1978-2009, 852 cases of DLBCL were presented at the sinunasal tract, with an average age of 65.8 years, with a male-female ratio of 1.2 to 1. Radiotherapy was administered in 57.9% of patients. The disease-specific survival at 1 and 5 years was greater in those receiving radiotherapy vs. those who did not (89.2% and 71.5%, respectively, at 1 year; 77.3% and 62.5%, respectively, at 5 years) . Figure 3: Images pre-, intra- and post treatment. Although there is some debate, the treatment is based on extrapolation: rituximab, cyclophosphamide, hydroxydaunomycin, vincristine, and prednisone (R-CHOP), followed by IFRT . Surgery is mainly limited to biopsies for diagnosis but rarely plays a key role in treatment. Historically significantly higher complete remission were observed in patients with early stages of disease and those without B symptoms. Similarly superior disease-free survival (DFS) after complete remission with CHT is frequently observed in patients with stage I and II disease. Patients who had nasal DLBCL shared some clinical similarities and had some disparities with patients who had lymph node DLBCL and nasal NK/T-cell lymphoma. In light of this, the optimal therapy for nasal DLBCL remains to be defined. Because the radio sensitivity of this histology, the doses are usually lower than those tolerated by the organs at risk, such as: eyes, optic nerves, chiasm, lens, etc, so own late effects of radiation observed in other head and neck tumors are uncommon in nasal DLBCL. Moreover involvement of multiple structures and absence of RT are negative prognostic indicators. Although anthracycline-based CHT with or without IFRT is considered the gold standard for DLBCL [15,16], locoregional treatment can be curative in 40-50% of patients with localized disease . Llorente JL, Lopez F, Suárez C, Hermsen MA (2014) Sinonasal carcinoma: clinical, pathological, genetic and therapeutic advances. Nat Rev Clin Oncol 11(8): 460-472. Dubal P, Dutta R, Vazquez A, Patel TD, Baredes S, et al. (2015) A Comparative Population-Based Analysis of Sinonasal Diffuse Large B-Cell and Extranodal NK/T-Cell Lymphomas. Laryngoscope 125(5): 1077-1083. Romero M, Lazos M, Cruz H, Vázquez HP, Cruz AAL, et al. (2008) Linfomas no Hodgkin de nariz, paladar y orofaringe en pacientes del Hospital General de México. Rev Med Hosp Gen Mex 71(3): 119-125. Li YX, Coucke PA, Li JY, Gu DZ, Liu XF, et al. (1998) Primary non-Hodgkin’s lymphoma of the nasal cavity: prognostic significance of paranasal extension and the role of radiotherapy and chemotherapy. Cancer 83(3): 449-456. Shikama N, Ikeda H, Nakamura S, Oguchi M, Isobe K, et al. (2001) Localized aggressive non- Hodgkin’s lymphoma of the nasal cavity: a survey by the Japan Lymphoma Radiation Therapy Group. Int J Radiat Oncol Biol Phys 51(5): 1228-1233. Casciato D, Territo M (2009) Manual de Oncología Clínica. (6th Edn), Lippincott Williams & Wilkins, Pennsylvania, USA, pp: 832. Vega F, Lin P, Madeiros J (2005) Extranodal lymphomas of the head and neck. Ann Diagn Pathol 9(6): 340-350. Verhoef G, Schroyens W, Bron D, Bonnet C, De Wilde V, et al. (2013) Guidelines for newly diagnosed diffuse large B-cell lymphoma (DLBCL) and relapse DLBCL. Belg J Hematol 4(2): 51-57. Kidwai S, Parasher A, Lin (2015) An unusual presentation of NK/T-cell lymphoma, nasal-type in the United States. Am J Otolaryngol 36(1): 80-83. Ning-Ning l, Ye-Xiong Li, Wang WH, Jin J, Song YW, et al. (2012) Clinical Behavior and Treatment Outcome of Primary Naal Diffuse Large B-Cell Lymphoma. Cancer118(6): 1593-1598. Yahalom J, Illidge T Specht L, Hoppe RT, Li YX, et al. (2015) Modern Radiation Therapy for Extranodal Lymphomas: Field and Dose Guidelines From the International Lymphoma Radiation Oncology Group. Int J Radiation Oncology Biol Phys 92(1): 11-31. Edward CH, Luther WB, Carlos AP, David EW (2013) Perez, Bradys Principles and Practice of Radiation Oncology. (6th Edn), Lippincott Williams & Wilkins, USA, pp: 1936. Kanumuri V, Khan MN, Vazquez A, Govindaraj S, Baredes S, et al. (2014) Diffuse large B-cell lymphoma of the sinonasal tract: Analysis of survival in 852 cases. Am J Otolaryngol 35(2): 154-158. Murawski N, Held G, Ziepert M, Kempf B, Viardot A, et al. (2014) The role of radiotherapy and intrathecal cns prophylaxis in extralymphatic craniofacial aggressive B-cell lymphomas. Blood 124(5): 720-728. Fisher RI, Gaynor ER, Dahlberg S, Oken MM, Grogan TM, et al. (1993) Comparison of a standard regimen (CHOP) with three intensive chemotherapy regimens for advanced non-Hodgkin’s lymphoma. N Engl J Med 328(14): 1002-1006. Miller TP, Dahlberg S, Cassady JR, Adelstein DJ, Spier CM, et al. (1998) Chemotherapy alone compared with chemotherapy plus radiotherapy for localized intermediate-and high-grade non-Hodgkin’s lymphoma. N Engl J Med 339(1): 21-26. Gospodarowicz MK, Sutcliffe SB (1995) The extranodal lymphomas. Seminars in Radiation Oncology 5(4): 281-300.